This transom was designed from a transom I saw over the entryway of a store in the Mall of America in Minneapolis/St. Paul. The original is shown on the left. It is a beautiful design containing a number of classic Victorian design elements. Phoebe called me about a transom that I had displayed on this website. She said she wanted me to build it....same size.....same colors.....no changes. I told her it was one of my favorite designs and that I built it for myself.....in fact......it has been hanging in a bay window in my kitchen for the last 8 years (photo on the right). After I secured my wife's permission to sell it (after promising to build another), Phoebe said "ship it on!" She had the perfect place for it. 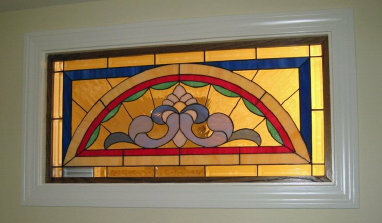 Phoebe was gracious enough to send some photos of her transom after it was installed. 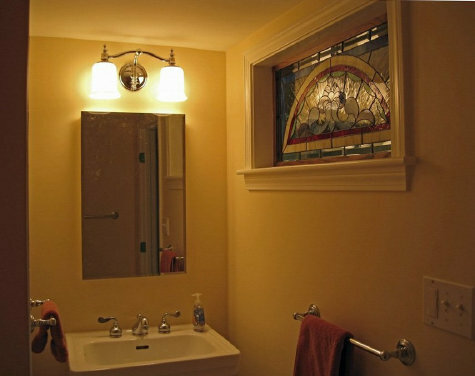 She built the transom into a wall in a windowless bathroom to bring light in and add sense of openness to the bathroom ....but installed it high to afford privacy. Note the magnificient installation job!